You may have heard of online advertising terms like Google AdWords, PPC, or search engine marketing, like many other people, you might not fully understand what those terms mean. From a broad view point, Google AdWords, PPC, and search engine marketing pretty much mean the same thing. We hope that after reading further you can make the determination if this marketing technique is something that can be beneficial to your business. S.E.M. is an acronym that stands for Search Engine Marketing. It is a form of internet marketing that involves advertising within search engines (Google, Yahoo!, etc.) on the search engine results page. The easiest way to understand this is to show an example. In the example below, I went to www.google.com and typed “buy tv” in the search box and pressed enter. What you see next is a screenshot of the search engine results page (SERP) – the listing circled in red is a paid/search engine marketing ad. The green circle represents a non-paid/organic listing. As you can see, the first listing is an “ad” from Samsung. Samsung is paying or using search engine marketing to jump to the top of the search engine results page. The next two listings from Best Buy are organic. That means, they did not pay anything to rank high on the first page, instead they are there because Google feels that those listings best match what the user was searching for. 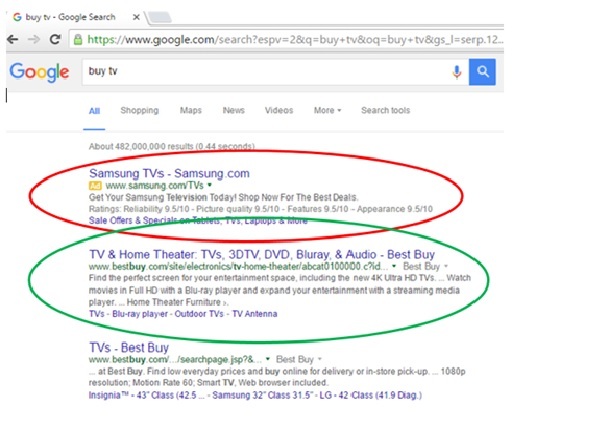 Best Buy is ranking high due to having the best content optimized for the Google search engine for the “buy tv” search term. For more information see our section about SEO here. The ultimate goal, in reference to ranking within a search engine, is to be on the first page and have the first search result listing. There are two ways of making this happen, paid listing and non-paid listing (organic listing). Paid listing is done through search engine marketing. Websites rank high organically due to search engine optimization. P.P.C. is an acronym that stands for pay per click. When you are using search engine marketing, you do not pay for your ad to be displayed, however you do pay when your ad is clicked. Hence the reason why search engine marketing is referred to as P.P.C. or pay per click. Google AdWords is the search engine marketing tool or P.P.C. program that is used to advertise within the Google search engine and Google partner websites. Other search engines like Bing use their own S.E.M. / P.P.C. program called BingAds. How Does S.E.M. / P.P.C. / Google AdWords Work? In the simplest form, an advertisement is created through a search engine and then search keyword(s) are created that trigger the ad. The ad displays when a user types in the “trigger words” in the search engine box. The process gets more advanced with options like adding placement exclusions, creating negative keywords, sitelink additions, and also using ad extensions. Finally, search engine marketing doesn’t just end with advertising within the search engine, you also can advertise on partner sites. For example, Google ads can appear on partner sites like YouTube.com, Fitness.com, PCmag.com, plus over one million more different websites. The beauty behind search engine marketing is that you only pay when someone shows enough interest in your ad to actually click it. When a user clicks your ad, it goes to a page you select within your website (landing page). At that point it’s up to the page/your website to convince the user to perform the desired action (purchase/call/brand/etc). If your ad displays and it is not clicked, then there is absolutely no charge. Think of it as free branding/advertising. In addition to search engine marketing, another P.P.C. technique called Remarketing has grown in popularity. Remarketing allows you to target customers who have actually been to your website and advertise directly to them when they go to other websites. For example, if you sell clothes online and someone went to your website and viewed a blue winter jacket, you could have an ad with that same blue winter jacket show up for the person who viewed your website when they are on other websites. Potentially offering a certain percentage off or use other measures to draw the interest of the user back to your website. Using Google as an example again, you select the area in which you want your ads to be displayed. You may select certain cities, counties, zip codes, states, countries, etc. You can even select a certain mile radius around a specific location (your store). The idea is, you only want to advertise to potential customers within a realistic service area. If you sell donuts in Detroit, Michigan, chances are someone from Grand Rapids, Michigan will not drive across the state to buy them. Instead, in this case it would make sense for the donut shop to only advertise locally. When you create an advertising campaign, you set a daily budget that you allow Google to spend on your ads. Budgets can vary from $2.00 a day all the way to thousands of dollars a day. Once your ad hits your budget for the day, it will stop displaying your ads. The cost per click on any of these forms of advertising vary based on many factors. If we take a look at the pricing structure for Google AdWords, the first thing we discover is that it is an auction based system that rewards those that a create high quality ad and landing page. The reward is lower costs and better ad placement/ranking. The basic formula is the following: Ad Rank = Pay Per Click Bid X Quality score. Pay Per Click Bid: Your maximum bid amount you selected for keyword. Quality Score: Internal score given by Google, that rates your ad on how useful and relevant it is to the user, the click through rate of your ad, and landing page relevance (the page the user goes to when they click your ad). The higher the score the better. Google does a great job in making sure that there is a fair playing field for all companies that want to use AdWords. The “business with the most money” does not always rank first. The business that creates useful content that is relevant to what people are searching for not only generally ranks higher, but also usually pays less money per click than businesses that have a lower quality score! Regarding the actual price, there are many factors that change the price by the search keyword set by Google, however based on our current client accounts, (in most cases) you can expect to spend anywhere from thirty cents to two dollars per click – up to your daily preset budget. Why Should You Do Search Engine Marketing? Search engine marketing is a great way to get your website noticed or listed on the first page of a search engine results page. If your website is not listed organically on the first or second page, chances are potential customers will not find your website. Paid advertising not only helps your website to rank high, but when more users start going to your website, your organic ranking will also improve. If you are interested in learning more about search engine marketing or would like to set it up, we would be happy to assist. 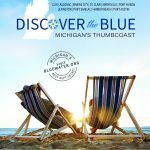 Petoskey Stone Media is certified by Google in Google AdWords.